Governance: Ibrahim Mahama leads Government Delegation to Tehran? Iran will redesign its Arak heavy water reactor to greatly limit the amount of plutonium it can make, the country's vice-president said on Saturday, marking a major concession from the Islamic Republic in negotiations with world powers over its contested nuclear programme. The comments by Vice President Ali Akbar Salehi comes as the talks face an informal 20 July deadline to hammer out a final deal to limit Iran's ability to build nuclear arms in exchange for ending the crippling economic sanctions it faces. Iran also said on Saturday that a plane which landed in Tehran airport flying the American flag was leased to Ghana's presidential office and carrying a business delegation from the West African nation. Iranian state television quoted Salehi, who heads the Atomic Energy Organization of Iran, as saying that Iran has proposed to redesign Arak to produce one-fifth of the plutonium initially planned for it. He said that will eliminate concerns the West has that Iran could use the plutonium produced at Arak to build a nuclear weapon. Salehi also said Iran has completed diluting its higher enriched uranium into less volatile forms as part of an interim deal reached last November with world powers. "The issue of heavy water reactor … has been virtually resolved," state television quoted Salehi as saying. "Iran has offered a proposal to … redesign the heart of the Arak facility and these six countries have agreed to that." There was no immediate comment from world powers, which include China, France, Germany, the United Kingdom, the US and Russia. However, what to do with Arak, a still under-construction 40-megawatt heavy water plant in central Iran, is a key factor in negotiations. Iranian Foreign Minister Mohammad Javad Zarif, his country's chief negotiator, suggested in March his country might redesign Arak to allay the west's fears. The West suspects Iran could use its nuclear programme to build nuclear weapons. 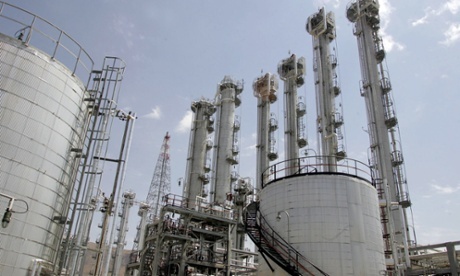 Iran says its programme is for peaceful purposes, like power generation and medical research. Authorities in Iran claimed it prevented attempted sabotage at Arak in March, blaming foreign intelligence services for tampering with imported pumps for the facility. Salehi also told Al-Alam, the Arabic channel of Iranian state television, that a proposal from the six-nation group was to change the heavy water reactor into a light water reactor. He suggested that Iran didn't agree because a heavy water reactor is needed to produce radioisotopes to treat medical patients while light water reactor, like the one Iran has at Bushehr, is used to generate electricity. Under the landmark November deal, Tehran stopped enrichment of uranium to 20%, which is a possible pathway to nuclear arms, in exchange for the easing of some Western sanctions. It also agreed to dilute half of its 20% enriched uranium into 5% and turn the remaining half into oxide, which is very difficult to be used for bomb-making materials. Also as part of the deal, Iran has allowed international inspectors from the United Nation's nuclear watchdog, the International Atomic Energy Agency, to visit nuclear facilities including Arak. On Thursday, the New York Times reported that a plane owned by the Bank of Utah was parked in Mehrabad Airport in Tehran. State Department spokeswoman Jen Psaki said on Friday sanctions "generally prohibit" US-registered aircraft from flying to Iran. On Friday night, state news agency quoted Iranian foreign ministry spokeswoman Marzieh Afkham as saying that the plane was transporting the brother of Ghana's president and a mining delegation. In Accra, an aide to President John Mahama denied that the president's brother Ibrahim Mahama – a multi-millionaire and the founder of the country's leading mining contracting firm Engineers and Planners – was part of the visit. "He was not in Tehran. His company plane was," the aide said, asking not to be named because he was not authorised to speak. "Lots of speculation in there is false," the aide added. The New York Times said it had reviewed a confidential document which showed that "the plane is held in a trust by the Bank of Utah and on behalf of the mining company, Engineers and Planners, which is based in Accra". It quoted a Bank of Utah executive, Brett King, as saying the company had no idea why the plane was at the airport and it was investigating further. In Washington, Psaki said on Friday the US Treasury Department would look into the matter to determine if there were any violation of sanctions imposed on Iran. "The Iranian transactions and sanctions regulations prohibit the exportation of goods, services or technology directly or indirectly from the United States or by a US person to Iran and would generally prohibit US-registered aircraft from flying to Iran," Psaki told reporters at a regular briefing. But Psaki noted that "there's a lot of nuance and a lot of different questions here". Former Iranian president Mahmoud Ahmadinejad visited Ghana, Africa'sNo2 gold producer, last April, as part of an effort to expand ties with African countries. His campaign yielded little in terms of trade and votes at the United Nations against sanctions. Mahama is an ally of the US – President Barack Obama visited Ghana in 2009.